What do you do when an employee takes a no-show, no-call leave? Do you discipline them immediately? Do you fire them? Or do you show some empathy? As a functional organization, it is imperative for you to have policies dealing with leaves of absence or emergencies. On the other hand, if as a boss or an organization you frequently face this no-show situation then there’s something amiss with your policy or you have very unsatisfied employees! Regardless of whether you have happy employees, one thing is pretty clear. It is against the norms of work ethics for employees to simply disappear. Of course, emergencies such as accidents, deaths or even an illness may be exceptions to the condition, but generally, it is unacceptable. In fact, in some organizations not showing up without informing the boss or team members is a violation of company rules and could result in the employee getting a warning letter or even fired. So in the light of this, what would you do if you had employees no-show? Here are a few tips to help. Efficient organizations have rules and policies in place for leaves, sick days, casual offs, vacations, short days, etc. When you establish policies for no-shows, you include them in the instructions or procedures employees are supposed to follow for availing a leave. You also need to clearly outline the consequences of missing work without informing - with an exception to conditions beyond one’s control. For example, illness (which is often the common reason for no-shows), employees should inform their bosses unless they’ve undergone an emergency and are hospitalized. This, however, does not apply to common ailments as the flu, viral fever, or other conditions where one can easily send a text message. Similarly, in the case of a bereaved family member, it is ideal if the employee could inform, but if not, that is understandable. Of course, you can’t narrowly tailor down situations in a policy book, but you can always give a general overview with consequences for being irresponsible. So, you have an employee who didn’t show up for the day? Don’t hold back. Even if you know the employee tends to be irresponsible or is planning to quit the organization; give them a call. Ask them politely why they are not in and whether they have any plans to come in the next day? Don’t wait for the employee to inform you. If they don’t come in within the usual time-frame, call and find out if there’s anything wrong. Being informed will help you to handle any ad-hoc task and assign it to someone else. It will also help you understand the scale of the absence - if an emergency or a death then perhaps they may not be in for a week. 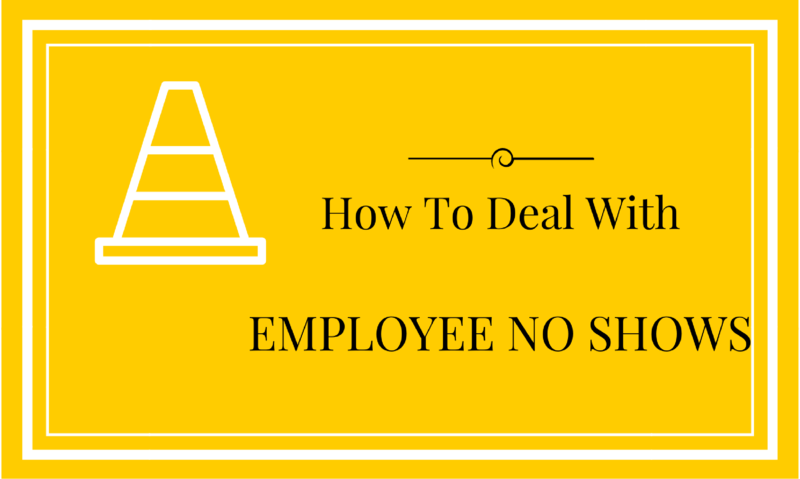 Be understanding of the situation and do not resort to judging your employees too soon. What If They Quit Without Informing? It’s pretty rare for employees to leave without notice because they know the negative impact of quitting a place without giving prior notice. You can’t just pick up your bags and leave. Permanent employees know that if they quit without notice they are not eligible for any exit package that they may have been entitled to. They may not even get the recommendations and references that they may need. In some worse cases, the company may even decide to terminate the employee for no-show even if they have quit. On the other hand, if employees are on probation, they may not be too careful with policies. They may simply leave only to send you a text message the next day (some may be too intimidated to even send a text message). In either case, if your employee quits without informing you, give them a chance at redemption. Inform them that if they don’t formally send in their notice, they may not be able to receive any exit privileges (letters, gratuity funds, last month’s pay, etc.). It may also cause them a bad reputation. With this information, it’s a definite you will get some sort of formal notice the next day. Once more, if you have policies in place and if your staff is well-trained, you may not face situations of repeat no-shows. A one-time warning is more than enough to scare an employee even if the no-show was intentional. Even then if you have a repeat offender who you value as an employee and don’t want to let go of because of a leave of absence, then you need to sit down with them and have a talk. Explain company policies, inform them of the consequences of their irresponsible behavior including missed deadlines, extra load, and strain on team members, and low team morale. Ask the employee to explain the no-shows and document every instance of a no-show. The employee should know that what they are doing will cause them to employment termination. Till now we’re just considering the low tier or mid-tier employee who seldom go against policies. What would you do if it is a high-level executive? Someone who is supposed to drive a department but acts irresponsibly? Well, if you are on the commanding end, you could simply have a one-on-one discussion with the executive and inform them of the impact of their actions. However, if you are under the management of the executive and your team effort and goals are being affected by the employee’s regular no-show, then you should formally inform the HR or the senior management of the company - whichever is a better option. The problem with people in higher management is that they know they can get away with breaking rules. What they don’t realize is the impact it leaves on team members who look up to them. In such cases, it is advisable to document such instances and the problems it caused the team. When you have solid evidence tying the executive’s no-show to problems in achieving goals, you have a strong case. Smart bosses, leaders and human resource professionals turn such instances into learning opportunities. If an employee is not taking company rules or policies seriously, then is there something their immediate manager is doing wrong? Is there favoritism? Or is it a manager who doesn’t know how to tackle the situation? If an employee is a repeat offender despite warnings and one-on-one discussions then are they unsatisfied with the work place? If these occurrences are happening frequently then is there something wrong with the company culture? Most often, employee behavior is a mirror of workplace culture. Happy employees know the rules and adhere to them. They are keen to serve their team and their organization well. Unsatisfied employees who want to get back at their bosses or at the management take on an irresponsible attitude and resort to problem behaviors such as no-shows, frequent days off, late arrivals, etc. As someone who is responsible for the smooth operation of your team and your organization, it is imperative for you to understand why such situations occur, what you can do to control them, and what lessons they teach you about your company.